Microsoft today introduced an enhanced, all-new version of Skype for iOS and Android devices that puts an emphasis on chats, chatbots, camera features, and its own version of Snapchat's Stories. The update comes with an overall change to Skype's visual design as well, with the company stating that it's decided to focus on allowing personal user choice to dictate how sections of the app look, including the ability to customize the app with your favorite color. Skype's home screen now sits with a "Chat" window on launch, and users can easily swipe to the Camera and new "Highlights" feature, which is an extended version of Stories. Here, users can take a picture or video, decorate it with emojis and text, and then post it to their Highlight. After posting, content is available for a full week instead of just 24 hours, and only users who follow you can see your Highlight. Specific individuals and groups can also be sent a Highlight before it's posted. Skype has also introduced Facebook-like reactions to both chats and Highlights, allowing users to select emojis to react to messages, pictures, and videos without having to text. In a talk with TechCrunch, Skype didn't balk at admitting it was inspired by Snapchat Stories, pointing out Facebook's own argument that the "Story" model is a format that can be used by anyone in the industry and isn't owned by Snapchat. Microsoft is also introducing its smart assistant Cortana into Skype, providing shortcuts to users in texts and suggesting quick responses. Other bots, or "add-ins," include Gfycat, Giphy, MSN Weather, Bing, Polls, Expedia, Stubhub, BigOven, YouTube, and Upworthy. Less emphasized in the update are Skype's traditional video call features, although they have received a few overhauls as well. Users will now be able to send large emojis over video chats, as well as text messages, stickers, and photos that appear as an overlay on the screen. Skype said that in the future it plans to introduce gaming features into video calls and the ability to synchronize and watch streaming videos together, rumored to begin with videos from YouTube, similar to Google's own UpTime app. The Skype update launches on Android first today, and is set to roll out to iOS devices in about a month. Mac and Windows devices will receive the update sometime within the next few months. 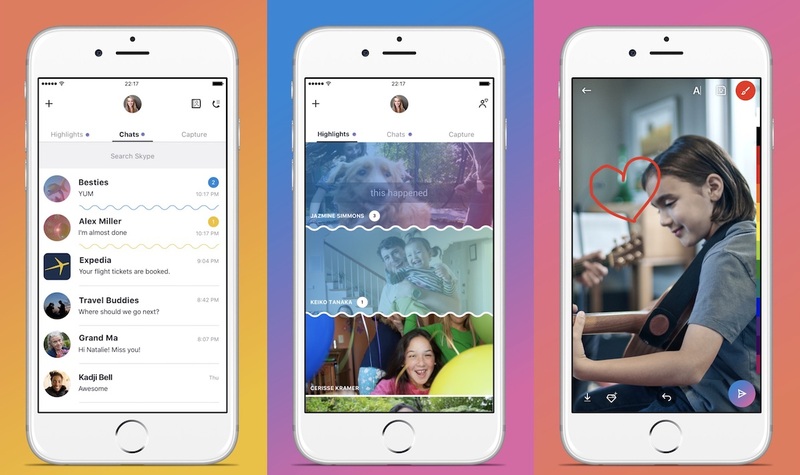 Update June 28: The "new Skype" has now launched on the iOS App Store, with the app's update notes stating: "It's the Skype that you know and love but enhanced with new features to help you connect with the people you care about." Jesus H Christ....Does every messenger and communications app nowadays need to be redesigned to appeal to the teenage crowd? How many messenger apps need the ability to squiggle pointless doodles on photos and videos? This is getting ridiculous. When corporations try to appeal to young users / copy Snapchat. They are trying to appeal to a market that isn't interested while abandoning a market that's been loyal. You beat me to it; glitzed up, dumbed down, built for teens to keep them glued to their mobile idiot boxes. How many decent apps have been destroyed by big enterprises who can't leave sodding well alone. Skype is Dead. Too Bad..... They had a chance to be number 1. Yes, but it's from Microsoft. And besides Skype no longer works on my PowerPC G5. Maybe, just maybe, it's time to move to Intel. They need to fix their notification problems. I still use Skype sometimes but most of the time I don't get the messages unless I open the app. Fix that first. Haven't used Skype since FaceTime was introduced back in 2010. Thanks but no thanks for the "extra" features, Skype.